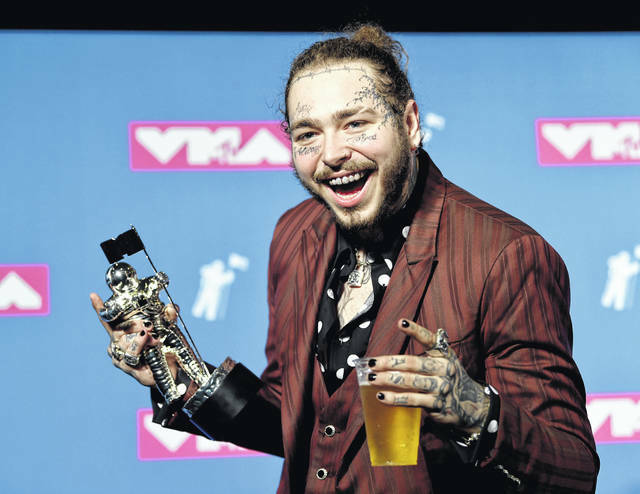 Post Malone poses with the award for song of the year for “Rockstar” in the press room at the MTV Video Music Awards at Radio City Music Hall on Monday. His private jet needed an emergency landing after two tired blew on takeoff. NEWBURGH, N.Y. — A private jet carrying rapper Post Malone blew two tires during takeoff at a small New Jersey airport on Tuesday but made a safe emergency landing hours later in upstate New York, prompting the rapper to thank fans who prayed for him and diss those who “wished death” on him while he was in the air. The plane had 16 people on board when it left Teterboro Airport around 10:50 a.m. Tuesday, the Federal Aviation Administration said, but didn’t specify if the number of people aboard included the pilot.